These guys are who you are most likely to see during your visit to the honey farm…Don’t they look like a friendly bunch? ???? They are here to welcome and chat to you about all things bees as well as help you with the many activities on offer such as candle rolling, beekeeping demos, bee a beekeeper and so on. You will mainly find Joe at the Critter Cabin, tending to the many insects and snakes we have here. Joe has been putting on shows for the public for over 30 years so we are lucky to have him here at the Critter Cabin most days. Verity is the creator of the Critter Cabin and also loves bugs, she is very passionate about bees and educating our visitors whilst having fun at the same time! Darren is very knowledgeable about bees and has his own hives at home, he’s always very keen to answer questions and educate any visitors during the daily tours and talks. Dan loves chatting to visitors and is very knowledgeable about honey. When Dan isn’t showing the visitors inside a beehive he can be seen working on the honey processing and bottling some delicious honey for the shop. 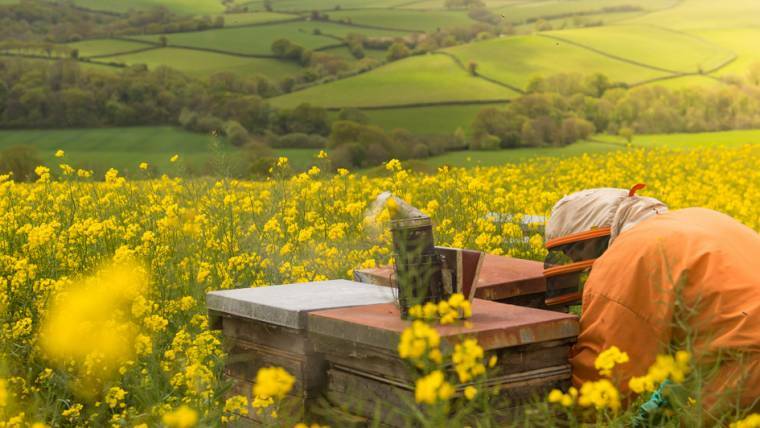 You will mainly find George in a beekeeping suit as during the week he goes beekeeping and tends to our many hives around North Devon. When he isn’t beekeeping he is entertaining the public and sharing his knowledge of bees and beekeeping with you. We have something happening every hour at the honey farm from guided tours, candle rolling, talks, beekeeping demos (where you can hold a frame of bees), Critter encounters and there is also a chance to be a beekeeper for 30 mins at one of the daily taster sessions. Check our social media channels and the activity boards on arrival so you don’t miss out!